We are proud to announce you our new calculation logic on Branch Management page. With Copado v12, the default calculation base on the Branch Management page will be User Story based calculation. There is no more need to a Recalculate button on each environment and a Recalculate functionality for all the environments which takes some time based on your current Deployment Flow setup. 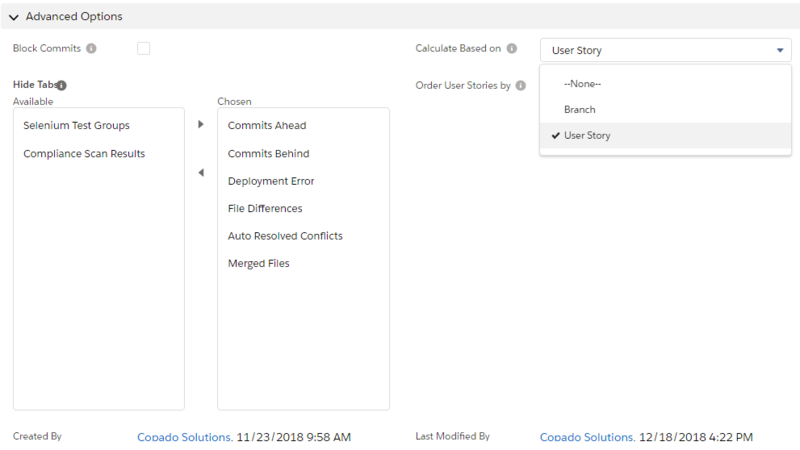 Within the new logic, the initial calculation will be really quick, since all the User Stories are already in the current instance and if you validate any User Story within the page, you can Refresh the Environment Statuses anytime from the left navigator panel which will definitely save you a lot of time. When you click on Validate Selections, you will be redirected to a newly created promotion page where you can track your validation deployment from the related list under promotion. If you want to switch to the Branch base calculation which existed before Copado v12, you can go to related Deployment Flow record and change the Calculate Based on field's value to Branch and click on the Release Management Page link. The Recalculate buttons on every Environment are back and the calculation logic is branch as before.